All Praise to Allah SWT for His blessings and Hidayah FEB UB is able to take part in actualize its mandate in field of education, research, and community service for the development of Indonesia. 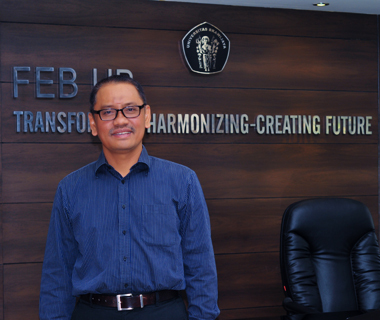 Firstly, I would like to express my gratitude for Prof. Candra F. Ananda’s big role in carrying out mandate as Dean of FEB UB, period 2013-2017. Hopefully what has been done counts as good deed and principal factor for the future progress of FEB UB. The recent “digital economy” development has greatly changed the nowadays behavior and economic preferences. One key to success in facing it is to continue making improvements and innovations which generate better added value. The FEB UB future success cannot be parted from the efforts to construct “entrepreneurial spirit” in an increasingly effective, efficient, professional and accountable bureaucracy. On the other hand, we have to maintain this collaboration in generating creative innovations thus it supports an increasingly conducive academic environment and atmosphere for FEB UB’s improved performance. Therefore, we invite all pertinent stakeholders to get involved in this collaboration and mutual cooperation to build our institution to be better, more beneficial and more advance in the future. May Allah SWT shower our good work with His blessing, and they become our good deeds in this world.